Richard Tiberius began painting nature with oils by the time he was ten years old, a lifelong passion he has balanced with a career as a university professor. Now retired from the university, he has a studio in Miami where he paints full time. Over the course of 60 years, Tiberius developed a unique knife technique that captures natural textures with extraordinary vividness and depth. He takes particular delight in celebrating the complex patterns of natural forms. The aim of his art is to celebrate the natural world. All of us are aware of the immeasurable value of the products of plants, from food and medicine to furniture, but his art celebrates an aspect of the the natural world that owes nothing to the industry of humanity. Richard’s compositions show plants and animals in their natural habitats. Each painting tells a story of the place of a plant or animal in the world. Scientists call these stories the natural history of the species. Honoring the history that brought each magnificent species to its present form is a kind of empathy. The word “empathy” sounds misplaced when applied to a relationship between a person and a plant but it feels like the right word when applied to Richard’s art. 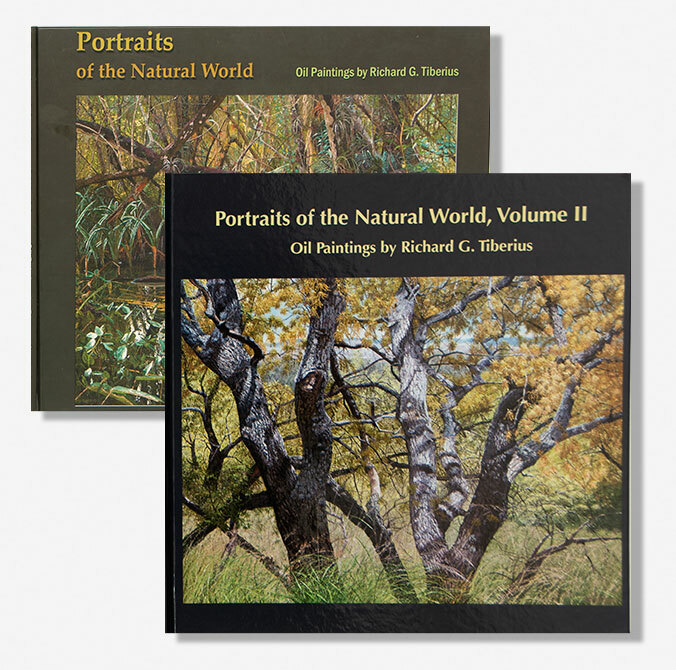 Richard believes that the more he learns about the natural history and ecology of each plant the more connected he feels with it. His representation in galleries and exhibitions began with the Katona Gallery in Los Angeles in 1971, followed by exhibitions and representations in Aurora, Ontario; the Teodora Gallery in Toronto; the Boca Raton and Beverly Hills locations of the Karen Lynn Gallery; the Gevik Gallery in Toronto; The Audubon Corkscrew Swamp Sanctuary; and with the Nature Conservancy. Currently, his work is represented in the Coconut Grove Gallery in Miami, the Artworks Gallery in Austin, and RC2 Gallery at Rosenbaum Contemporary in Boca Raton. Richard is delighted that his daughter Kiry has mastered his knife technique and joined his studio where they benefit from critiquing each other’s work and occasionally create collaborative pieces. He greatly values her contributions regarding the composition of his work. Kiry Tiberius shares a studio with her father in Miami, Florida. In her early teens, Kiry began learning her father’s knife painting technique—one not available from any school. The texture created by the knife brings to the work a unique depth and lifelike quality. Her father, internationally known painter Richard Tiberius, has invested over sixty years in developing a unique knife painting style in oil on panel. Kiry is proud to be the second generation in a family tradition. Her father has always signed his paintings TIBERIUS. Kiry has chosen to sign her paintings TIBERIUS II to emphasize the continuity. In their collaborative projects, which are becoming more frequent, they sign their work TIBERIUS I & II. Kiry’s work is currently represented in the Coconut Grove Gallery in Miami and the RC2 Gallery at Rosenbaum Contemporary in Boca Raton. Kiry was born in Toronto, Canada where she fell in love with Canada’s pristine wilderness. Since moving to Miami with her family, at age 14, Kiry has grown passionate about Florida’s diverse plants and animals. Like her father, Kiry’s love of wild nature has deeply influenced all of her work. Whether it was nurtured in her from the many hiking trips throughout her childhood, or developed from some innate connection with the beauty of the earth, Kiry is devoted to expressing the value and richness of wild nature. She shares with the viewer an appreciation for the richness of biodiversity. Her work speaks for every species of plant and animal as individually precious.